With the mighty massif of the Zugspitze at our backs, our starting point is the first highlight. On lonely roads we'll climb the Fern Pass and roll by the crystal blue waters of Lake Fernstein with its romantic castle. Alpine landscape straight out of a picture book. We arrive and stay over night in the Pitztal valley. The main Alpine ridge is practically within reach. We'll climb up to the Pillerhöhe on forest paths. We'll have a great view of the Ötztal Alps and then we'll enjoy the fast downhill ride to the ice-blue Inn river. We'll reach Lafairs on an old Roman road and secret trails. Relaxation in the sauna. 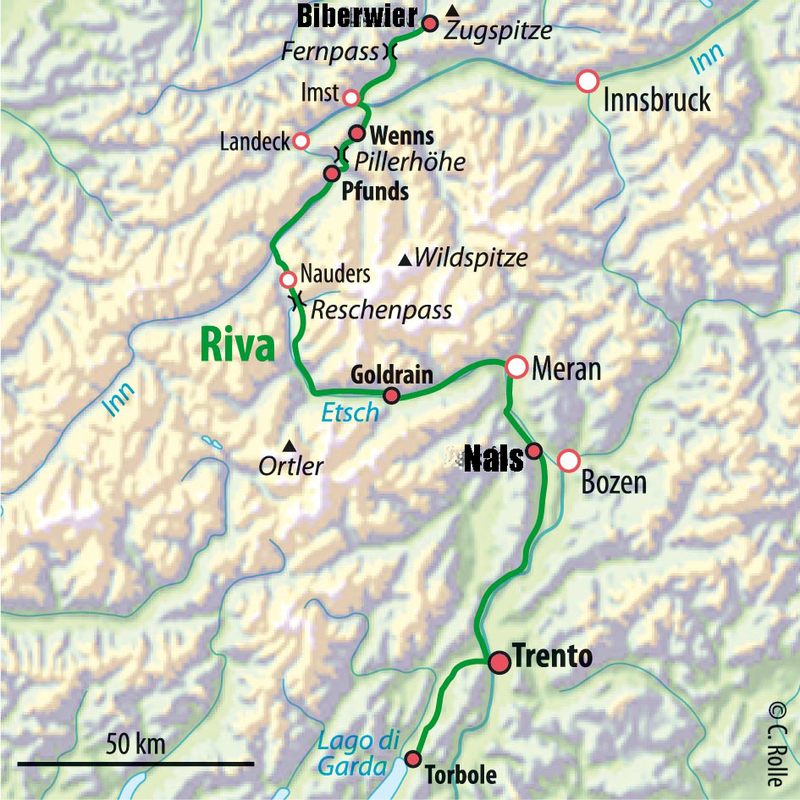 Even the Romans had respect for the Finstermünz Gorge, which is like an insurmountable bar blocking access to the Reschen Pass. Our mountain bikes master this challenge with flying colors and then Lake Reschensee lies at our feet. Mount Ortler's eternal ice within view, we'll zoom down into the Vinschgau Valley. Lovely South Tyrol - here we come! A day for the senses. With a friendly "hello", we'll pass Reinhold Messner's castle and enjoy cappuccino in legendary Merano. The typical lunch break will be in a Buschenschänke (mixture of restaurant and tavern) serving homemade elderberry juice and tasty bacon. Today's destination is the wine-growing town Nals in the Appiano municipality. We'll relax in our hotel spa. Vineyards, Lake Kaltern and the view of the white Dolomites characterize our eventful day today. In the afternoon, we'll whiz down along the Adige river towards Trento, where the Counter-Reformation started. There will be plenty of time for shopping or excursions. Lake Garda is right around the corner! We'll pass quaint villages and admire the climbing acrobats in the wild Sarca Valley. Italy envelops us. Arrival at the mecca of mountain bikers. We'll enjoy a multi-course farewell dinner together. After breakfast, the bikes are loaded onto the bus. Return trip by bus back to Ehrwald. Upon arrival in Ehrwald, everyone travels home individually. Andrea Obletter, ALPS bike guide for the Transalp Riva. Arrival: Arrival by car or train to Ehrwald/Austria. Type of route: Forest and bike paths, asphalt side roads, short trail passages. Included in the price: Guided tour with 7 overnight stays and half board (breakfast buffet, multi-course dinner menus, farewell menu) in good 3 or 4-star hotels, often with a spa, in a double room. Luggage transport, return transfer in a comfortable bus. June: 15. /	23. /	29. July: 06. /	07. ** /	13. /	14. * /	20. /	21. ** /	27. /	28. August: 03. /	04. ** /	10. /	11. /	17. /	18. ** /	24. /	25. /	31.